Sometimes, we come across a piece of equipment so amazing that it makes us reconsider our preconceived notions of the industry. It happened with the Napoleon Ultimate 9700 Furnace featuring conveniences and design elements that we’d never seen in a furnace before. It happened when we saw the Bosch IDS heat pump, an inverter-driven condenser that provides perfect comfort without a communicating thermostat. 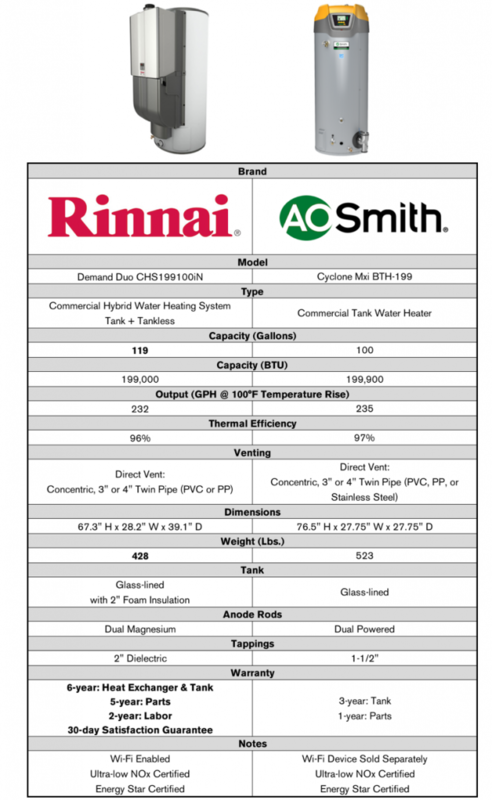 Most recently, it happened when we were introduced to Rinnai’s Demand Duo commercial water heating system. At a glance, the Demand Duo might simply seem impressive but not groundbreaking. The Demand Duo essentially consists of a Rinnai C199 tankless water heater, a 119-gallon insulated, glass-lined tank, and a Wi-Fi ready control. It’s ultra-low NOx certified, and Energy Star certified. It’s lighter, more powerful, and easier to install than the competition. It’s the best commercial water heater available in pretty much every quantifiable way and it’s backed by the best warranty we’ve ever seen. Once you bring the Demand Duo on board, you’ll never need to quote another commercial water heater. That’s a pretty bold claim, but we’ve got the facts to back it up. The Demand Duo has the power and efficiency to tackle any job. 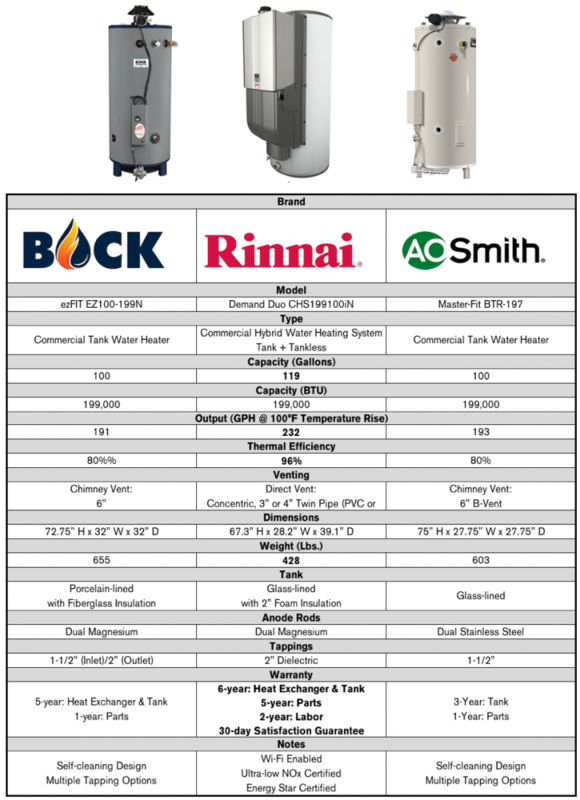 Check out how it compares to other water heaters in high-demand (six gallons per minute) situations. The Demand Duo provides stable temperatures for about twice as long as the competition. 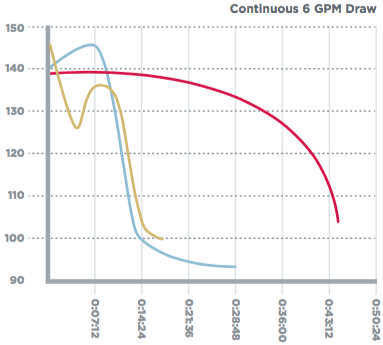 With a 232 GPH output at a 100°F temperature rise, the Demand Duo can satisfy a 3.86 GPM draw indefinitely. For a more direct comparison of the Demand Duo and other popular water heaters, check out the tables below. As you can see, the Demand Duo crushes standard water heaters. It looks fairly comparable to A.O. Smith’s Cyclone Mxi high-efficiency model, but that’s before you get to the price. The BTH-199 costs roughly 50% more than the Demand Duo. Let that sink in. If you go with the Cyclone Mxi, you’re paying an extra 50 cents on the dollar for a product that has essentially the same output and efficiency. And we haven’t even gotten to the warranties yet. That’s right, if your client finds that the Demand Duo is satisfying their hot water needs during the first month after installation, Rinnai will cover the cost of a replacement and the labor required to install the replacement. The Demand Duo has all of the storage that you’ll ever need and all of the power you expect from Rinnai. It’s the best commercial water heater we’ve ever seen–hands down. Between the price point, the technology, and the warranties, the Demand Duo stands in a class by itself. And it’s available now at Able Distributors.